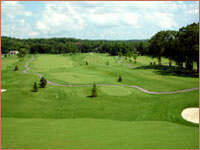 This links-style course was designed to be fun and a challenge to golfers of all ages. Water hazards come into play on 2 of the holes and sand bunkers were placed in the design of 8 of the holes. 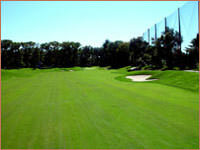 The fairway of this short par 4 is wide open, separated from the driving range on the right by high net fencing. Approaching the green from the left will avoid not only the driving range, but also the bunker on the right. Great birdie opportunity. 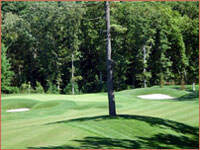 3 bunkers in the front and 2 bunkers in the back surround the green of this medium-length par 3. Pin placement behind the 2 bunkers on the left means a long putt when approaching from the right side. The safest tee shot here is to aim left, avoiding the fairway bunkers on the right. There are also bunkers on the left and right protecting the two-tiered green on this hole. The tee shot on this hole will be the least challenging. The second shot is important here; stay right, but avoid the pine tree in the middle of the fairway, and you will also avoid the unseen maze of bunkers to the left. 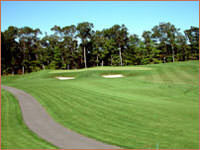 This beautiful rolling green adjoins the green on hole #7. 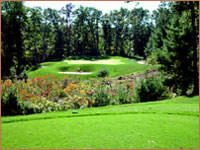 The right club selection is critical for this beautiful yet challenging short par 3. The long hitters will find themselves off the back of the green, while the short hitters will find themselves either in the marsh or the bunker in front of the green. 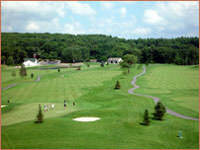 The extremely large green is not visible from the tee box and the fairway runs alongside a wooded area. A fade shot off the tee will give you a better view of the green. A fairway bunker on the right should be avoided on the second shot. It is not only the toughest hole on the course, but the most beautiful as well. 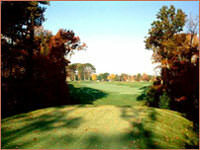 The green on this wide-open par 5 adjoins the green on hole #4 and is also protected by the same maze of bunkers, which are on the right side of the fairway for this hole. 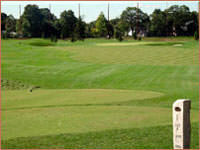 Approach the green from the left side of the fairway and you will have a birdie opportunity here. The prevailing winds could be a factor on this long par 4. Avoid the bunkers on both the left and right side of the green. Pin placement on this green could be the difference between a par and a bogie. 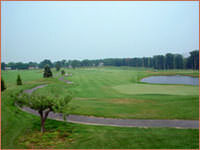 The tee box on this hole is the best vantage point to view the magnificent pond in front of the clubhouse. Staying to the right is the best way to avoid having to take a drop at the pond. The large green on this hole offers a real challenge.